To use this formula, the load must be axial, the bar must have a uniform cross-sectional area, and the stress must not exceed the proportional limit. 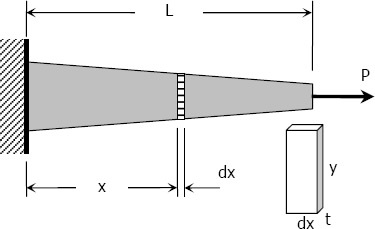 If however, the cross-sectional area is not uniform, the axial deformation can be determined by considering a differential length and applying integration. where A = ty, and y and t if variable, must be expressed in terms of x.
where ρ is in kg/m3, L is the length of the rod in mm, M is the total mass of the rod in kg, A is the cross-sectional area of the rod in mm2, and g = 9.81 m/s2. Stiffness is the ratio of the steady force acting on an elastic body to the resulting displacement. It has the unit of N/mm. Permalink Submitted by Lorenzo B. Sabado on October 29, 2017 - 7:38am. Great help to all engineering students.